It’s reliable, flexible, and scalable. That’s what makes Connect different. 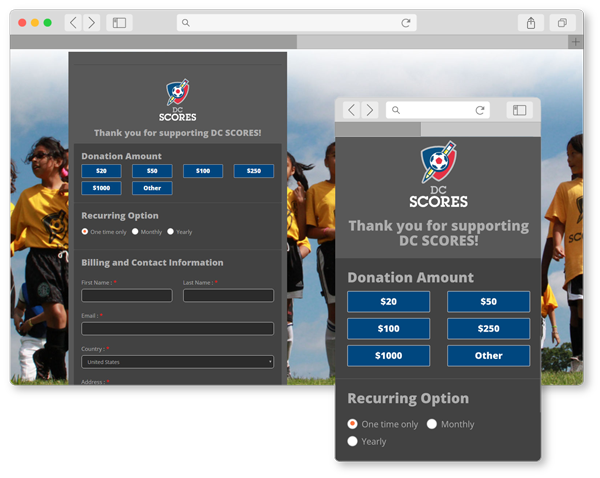 With online fundraising software this robust, other platforms just seem trivial. Your growth is an expectation, not just a dream. Whether your mission is in the grassroots phase or a household name, we house your entire online fundraising presence under one roof. Choose from a beautiful array of mobile-friendly templates, or create your own. 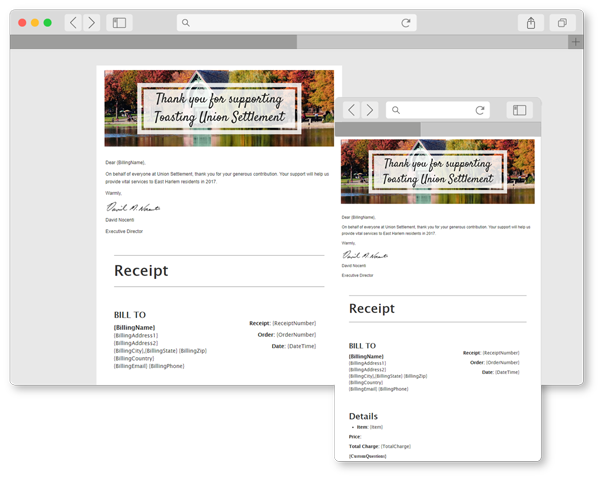 Add email receipts or recurring payment options to any donation form. Available 24×7 for real-time downloads, they’re ready when you are. An easy way to take donations globally with Visa and MasterCard. Sponsor posts right within our platform to boost your social presence. Our plugin helps keep your WordPress site and donation forms lightning fast. pledgeTV™ is a revolutionary video player that lets donors give while they watch. Use pledgeTV™ within Connect to accept and process electronic credit card payments through video, capturing hearts and contributions at the same time. Our forms are convenient, reliable, and they look great, too. No coding experience required. Click-and-drop editing makes form creation a breeze. Track and analyze tax-deductible contributions. Offer recurring payments to valuable repeat donors with an array of scheduling options. Embed forms directly into your website as an iframe or overlay — or use a secure, standalone link. Keep everybody on the same page with instant receipts. Help your donors keep track of their finances and contributions with real-time email receipts. You’ll also receive a copy for your records, upon authorization. Control what you need to see, whenever you need to see it. Just download the CSV file for immediate, synchronized review. And if you accidentally delete that, don’t worry — we store the backups for you, too. We’re as secure as it gets with PCI Level 1 Certification. Link your Click & Pledge account to our AI Assistant, using Alexa or Google, to hear your statistics in real-time. We never store credit card information, and always keep your sensitive data safe on our private, secure servers. Accept donations from around the globe. 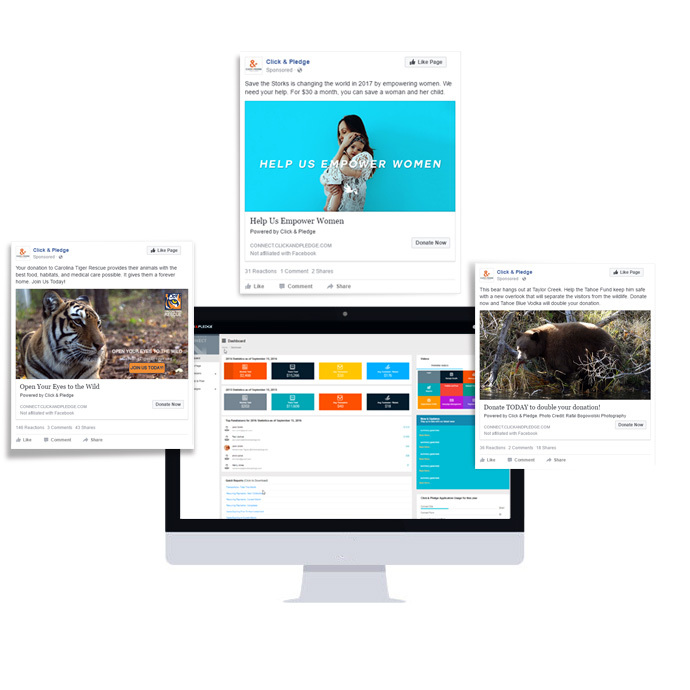 Address your custom audience with our new Facebook ads feature. Gain social visibility by creating ads that appear on Facebook’s social media network. These ads link to your campaigns and payment forms, so donors know exactly where to give. 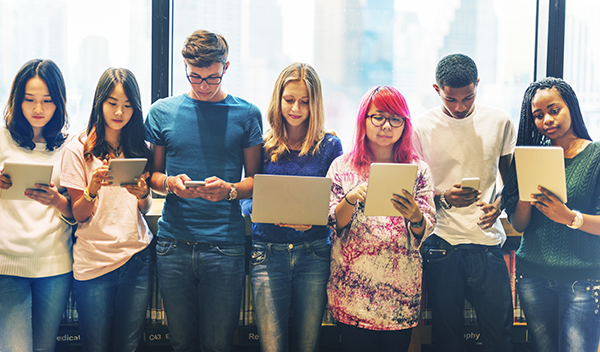 Refine your audience by using Facebook’s Custom Audience feature to identify your donor or email lists via social media profiles. We’ll pay for your ads, schedule them, and send them out to a national audience to help save your organization’s budget. Our plugin integrates your donation form with ease and speed. Host your payment form with lightning-fast speed via shortcode. Be ready for any time of the year. Create form groups that change based on start and end dates. Supports WordPress 4.7 and above.